We take safety very seriously at FlashFog. 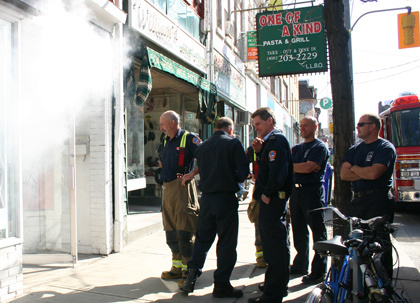 Our installation process includes posting clear warning signs on the premises, and informing local police and fire departments of the security fog installation. There has never been a single incident of injury as a result of a FlashFog security installation. Infact, even with over 120,000 security fog installations worldwide and countless burglaries stopped, we are unable to locate a single instance of injury or harm to a bystander or emergency responder as a result of any security fog device. The fog deployed by FlashFog devices is white, odourless, and flashing brightly due to the strobe light. Because of this it can be easily distinguished from the smoke caused by a fire. If you have any questions or concerns about the safety of using our security fog systems for intruder protection, please Contact Us! Sign up for the FlashFog Newsletter to receive exclusive promotions, updates about FlashFog demonstrations and news regarding the security fog industry.